Here are step-by-step instructions for setting up a server to process messages from the OpenTravel project. In this tutorial you will create a module to service the OpenTravel "Ping Request". Download my (tiny) opentravel-webservice framework from the OpenTravel tools project and unzip it. There are several other open source tools in this project that you may want to look at... or contribute to! Make sure the Java sdk is installed. Install Apache Maven. This program auto-installs all the build tools and libraries that you will need. Make sure mvn is in your path. Install a osgi server. I prefer the fuse distribution of Apache Servicemix. Almost all web servers can handle osgi modules, but servicemix has some cool capabilities and tutorials (I based this tutorial on their getting started tutorial). Install soapui (Optional - If you prefer another web services client, use it). You may have also noticed there is a soaui test framework on the OpenTravel Tools site. Now you're ready to get started! Now open the test suite and hit the run button. Cool, all the tests are successful! 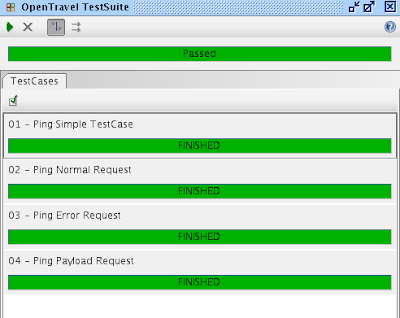 This project is a great starting point for your OpenTravel implementation or test project. Please leave a comment if would like more blogs on this subject... or if you have any questions or recommendations! If you haven't run maven before, downloading all the dependencies can take some time. Glad to hear you were successful! Thank you for your enlighten. I had installed it and it work. However I need to change it from localhost:9090 to have it connect from remote machine. Can you please inform me? there is no sub-dir as cxf? emix.cxf.transport.osgi/4.2.0-fuse-SNAPSHOT] could not be resolved. In your project there is opentravel-webservice-bc\src\main\resources\wsdl\openTravelService.wsdl file. May I know, How did u create this openTravelService.wsdl file? Is it written manualy? Yes I created the wsdl manually. This is an example of wsdl first development. As complicated as the wsdl looks, most of it is boilerplate code. Only a small portion of this wsdl is specific to this application. This is a very simple fix. You should not have changed the web addresses of the opentravel urls in your wsdl file. Change the wsdl in your project that references https://xmlprosdk.wspan.com/msgdoc/wsdl/OTA_AirFlifoRS.xsd to http://www.opentravel.org/2011B/OTA_AirFlifoRS.xsd and everthing will work fine. Specifically, the error you are getting is due to the fact that you modified the OTA_AirFlifoRS.xsd and removed the 'include' element. There is no way for the php xml parser to find the referenced types. Again, just reference the on-line versions of the schema and it will work. Hi, I need to import the ota wsdl in .Net via visual studio wsld generation tools. Is any body familiar with ota in .Net? Where can I find the ota wsdl? I've only the xsd schemmas.